﻿ I thoroughly enjoyed reading Birdology by Sy Montgomery. I learned a lot about birds, and she made it all seem fascinating. 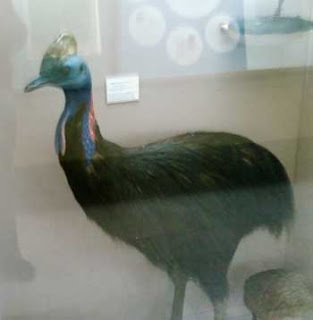 One of the most intriguing birds she wrote about were the cassowaries, large creatures which can be as tall as 5 ft. and are descended from dinosaurs. The author mentions that she had traveled to the Carnegie Museum of Natural History in Pittsburgh specifically to see the remains of one of these often-dangerous birds. Well, since the museum is just down the street a ways we visited and found this stuffed version of a cassowary on display with other bird species. Cassowaries can be found these days in Australia and New Guinea. But in the Museum's new Dinosaur in Their Time exhibit, we saw the skeletal remains of this bird's predecessor, which is a lot longer, taller and even more mean-looking if that's possible. If you like birds, take a look at Birdology. It's a fun read. You may have noticed that within the past couple of days the header for this blog changed. We added the "little people" as I like to call them which have enhanced my website at BoomThis.com. for a few years. We worked hard at that time to find just the right little people for each of the pages on the site. Since we had moved them over to this blog and they are even more front-and-center than before, I began to search for a name for them. Last night we were out with a group of friends and on the wine bottle's label we ordered was the answer to my quest: Little Boomey. The wine, from Australia, has a little boomerang on the label, hence the name. So from now on the clever little characters will be called Boomeys! Perfect. Copyright 2010 Teresa K. Flatley. Simple theme. Powered by Blogger.